My veggie garden has started yielding long green chilies, bell peppers and some spicy chilies. They are supposed to turn red when the heat is assimilated. But they can be plucked when green too for a milder flavor. They taste like a thinner version of bell peppers then. So for the JFI- Chilies,hosted by the multi talented Nandita of Saffron Trail, I picked only some of them (leaving the rest to ripen) and added some other long chilies in my refrigerator and made a traditonal thottu kootan. It literally means "a curry to be tasted (not poured)". A thottu kootan is a simple chutney-like side dish, a mixture of sour, sweet, and spicy flavors to offset the richness of a meat curry or to enhance the lightness of a lentil curry. Traditionally, this is a must on the Ghee Rice menu along with Mutton stew, and thick Lentils(Parippu). 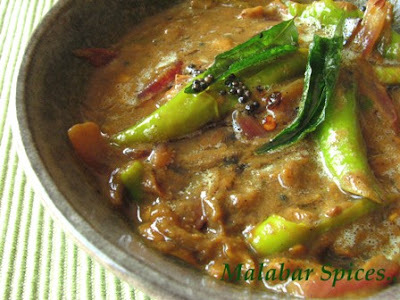 A thottu kootan can be made with either tomato or green chilies, okra or bitter gourd, though not all together. We use long green chilies for this which have a lot of flavor but are not as spicy as the tiny ones. You don't have to remove the seeds nor add any more red chili powder. This is not an extremely spicy dish.. it is more for the inherent flavor of the chilies that are often overlooked in the shadow of its spiciness. 1. Slit the green chilies up to the stem but keep them intact at top. Slice the onions finely. If using fresh tamarind, soak a small lime size ball in warm water and extract the juice. If using the store bought tamarind, use very little (1tsp or less)as it is in concentrated form. 2. Do the seasoning first: Heat the oil in a heavy bottom pan. After a minute, lower the heat and add the mustard seeds and cover till it finishes spluttering. Now add the curry leaves and the fenugreek seeds, onions, green chilies and saute for about 5 minutes on medium heat. Add the ginger-garlic paste and keep stirring. When the raw smell disappears, add the turmeric, coriander and fennel powder. Stir for 2 minutes on very low heat to fry the spices and then add the tamarind extract and salt. Let it cook on medium heat till the chilies soften and the gravy thickens. ..about 6-7 minutes. Serve hot with ghee rice and curry or with rotis. Green Chilli Chutney looks absolutely delish! thanks for that spicy creation - cya at the JFi round up! looks yummy shah, I've never seen a chili chutney version without grinding the chillies, this is quite different... will try it for sure. hey...strange...i have never tasted this thottu koottan....! malabar special aano? Oh Delicious! That alone will keep me going for weeks. Beautiful Koottan! I do the same,pluck them a little early to make a milder sauce but banana peppers still gave me stomach ache! Hot hot hot! I love it. Mishmash, hmm.. malabar special aanu. will go well with ur veg ghee rice. Indo, do try and let me know. Are u growing peppers too? Asha, i forgot what these peppers are called. i hav eone turning fiery red now..let me see. WOW! Hot and spicy! This is a lovely looking and sounding recipe. Love the kootan.Fine recipe.the utensil?manchatti? ?looks like cast iron too..
Nice one Shaheen, I haven't seen this thottu kootan at my place... want to taste that now! sharmi, yup, its a classic recipe. do try it. Meeta, chilies have to spicy right? Bharthy, the bowl is just a grey colored bowl. I am going over to ur meen curry now. Jyo, i guess its more malabari in origin, not very common else where. u will like it. 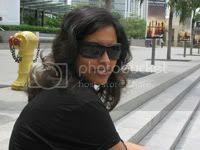 Thottu koottan is totally new to me also. Will have to try it soon. Thanks for sharing this new recipe. Absolutely Delicious. Have never tasted it before. I love mallu food. 1. How much water must one use for making the tamarind extract? 2. Have you added water later to the koottan after adding the tamarind extract?